There are three types of decisions that need to be considered when budgeting for your History Encounters journey: 1) Where your group is traveling from; 2) The choices about what sites will be included in the schedule; and, 3) How many days it will be. We are experts in working with your budget and helping get the most out of your trip. What is covered by the cost? History Encounters journeys are all-inclusive. The program fee includes all your meals, accommodations, guides, transportation, and admissions fees are covered from the moment you touch down in Philadelphia until you depart. If you opt for one of our travel packages, then airfare, taxes, and all fees, including luggage, are included as well. Freedoms Foundation provides a host of fundraising ideas for individual families and school groups like the PTA to help make the History Encounters journey open to all who want to go. If a school would like to offer scholarships to a limited number of students, we can add a cost sharing contribution to every paying participant equal to the total amount of scholarships offered. Grade-level teachers and the school principal who attend a History Encounters journey with their class free-of-charge for the program fee. For air travel, the ticket price, fees, and taxes for teachers and principal are included in the students’ and parents’ ticket cost when FFVF arranges the flights. If your group is arranging their own air travel, you would be responsible for covering the cost of teachers and principal to fly. Can FFVF accommodate special needs students? Though the campus was built in the 1960s and 70s, every building has a ramp entrance and we have rooms that can accommodate a variety of specials needs and we have buses with handicap and wheelchair entrances. It is important to realize that some historical sites on the itinerary may not be as accommodating. Some old buildings will not have elevators. Most History Encounters journeys are one week, Monday – Friday, but there are schools who have extended their travel to include one, two, or three days more. Some groups have chosen to spend less time. How many can come on the trip? Freedoms Foundation can house up to 125 students and chaperones on its Valley Forge campus. If your group exceeds this number, multiple trips can be scheduled to accommodate all those participating. Who plans our trip and can we make changes to the schedule? Customization is the key to a History Encounters journey. Our touring experts will work with your group’s leader to plan an educational experience that complements your school’s curriculum and hits all the highlights that are important to you. We will make suggestions based on our long experience working with groups like yours, but your school will always have a trip created just for you. Who makes our travel arrangements to Freedoms Foundation? Freedoms Foundation offers full service planning for your group, including making your air travel arrangements to and from Philadelphia. Working with travel professionals, we will make sure we find your group the most economical and reliable flight for the entire group. If you would prefer to make your own arrangements, you have that option as well. Can we use our own travel agent? If your school has a relationship with a travel company and would like to book your own air transportation, that is not a problem. There are programs running all year long at Freedoms Foundation, so we can accommodate groups fall, winter, spring, or summer. Because all our educational programs take place on our Valley Forge campus, it is always best to have some flexibility when you can travel. The size of your group will determine whether your entire group travels together, both to Philadelphia and while you are here. With enough lead time, we have always been able to keep groups to for the air travel to Philadelphia, even for very large groups. Once here, groups travel together, but in groups of approximately 40 – 45, the capacity of a coach bus. Sometimes, depending on the sites to be visited, busses may split up for part of the day and rejoin for others. For example, a large group of 80 visiting Colonial Philadelphia would divide to explore the Independence Hall, the Liberty Bell, Trinity Church, then meet up for lunch and the Museum of the American Revolution. What happens if we miss our flight? We recommend that everyone do all they can to arrive early at the airport and make their flight, but we understand sometimes life spins beyond your control. If your group books their air travel with FFVF, our travel professionals will immediately start to work to book you and anyone else from the group who missed the flight. In the past they have been able to arrange transport on the next flight from the same airport, but that is not always possible. They will get you to Philadelphia though. If your group booked their own air travel, then you will need to work with whoever booked your flight (or directly with the airline) to reschedule your flight. A packing list is available on our website, but here are the basics: comfortable clothes and good walking shoes (an extra pair helps in case things get wet), weather appropriate gear (coats, gloves, scarves, hats, boots in winter, rain gear in spring and summer), camera, journal, a sturdy backpack, and toiletries. Books, magazines, music, or a tablet computer for the air travel portion of the trip is always a plus. And save room for the souvenirs you’ll want to bring back home. The History Encounters model is an educational experience first and foremost, and teachers take the lead. Normally the teachers form a core group with the principal (or other administrator) to organize the parent chaperones and, with our FFVF staff, make their History Encounters journey a fun, learning adventure. Most schools have a preferred ratio of adults to children for field trips, but as a minimum we recommend 1:10 parents chaperones to elementary and middle school student participants, in addition to teachers and administrator. High school groups may opt for fewer. It is also important that there be enough male and female parent chaperones cover nighttime dormitory. Who makes a good chaperone? The best chaperones are those who recognize their first and only responsibility is the safety of the students coming. They are not on a vacation, and learning about the sites you will be visiting is secondary. If possible, it is also helpful to have parent chaperones with special training, doctors, nurses, paramedics or anyone with first aid training is always helpful. How does Freedoms Foundation make sure everyone is safe and secure? There is so much to see and do, so it’s a long day when traveling on a History Encounters journey. Typically a day starts with breakfast at 7 AM, touring all day, return to FFVF around 5 PM, free time, dinner, and evening activities wrapping up around 9 PM. Days can be longer if traveling farther afield like New York or Washington, DC. Your group leader controls the schedule, so the actual schedule varies from group to group. Weather is always at play with traveling to and from Philadelphia and touring the region. Normally the weather is relatively mild in all seasons, but rarely does it interfere with travel plans. It’s important to dress appropriately for the season (we have suggested packing lists for each season), and FFVF staff will make sure that even on the coldest day you will still see a lot and learn a lot. One advantage of allowing FFVF to make your air travel arrangements is that our travel professionals will make all the necessary arrangements should your flight be affected by weather, and you and your group can just sit back and relax. Will the kids have free time? One of the great advantages of having our own campus is free time for the groups. We have an indoor game room with pool table, ping pong, foosball, and a video game system, and outdoor basketball and volley ball courts, and plenty of open space for pickup games of soccer, football, ultimate Frisbees, and in winter, evening some sledding. Are students allowed to bring electronics? School leaders will make the decision on electronics during your History Encounters journey. Some schools do request all electronics be surrendered after arrival to cut down on distractions while touring or loss of sleep at night. Others operate on a case by case basis, allowing students to keep their electronics as long as they use them appropriately. The dorms do have wifi for adults to stay connected to news, home, and even stream a movie after lights out. Can my child call home regularly? We encourage schools groups to set up alternative forms of communication with family back home. Some schools use old fashioned phone trees with group leaders making initial contact and then families calling each other. Some schools utilize technology to stay in touch with apps like Groupme. We find it is best for parents to allow their children to spend all their time focused on the things they are exploring on their journey and then sharing all of that when they return home. Plus it makes the post card they send from Ben Franklin’s Post Office all that much more fun. Finally, some students become homesick when they spend too much time talking to family back home. What if my child gets sick on the trip? Together FFVF staff and the school chaperones work to make sure every child stays healthy, but we know kids get sick. FFVF staff are trained in basic first aid, and our fire department first responders are literally across the street, and the local hospital is five minutes down the road. We also recommend that when possible groups bring a doctor or nurse parent chaperone to assess any sickness or injury that arises over the time here. What if my child doesn’t want to participate in an activity? How much physical activity is involved in the tours? There is a moderate amount of walking while on a History Encounters journey, and stairs particularly in some more historic buildings. Certain days will have more walking than others (colonial Philadelphia, NYC, DC) but others are less strenuous. Since this is an all-inclusive journey, there are only two real reasons for students to bring money: souvenirs and snacks. Everything else, including all meals, are included. Teachers and parent chaperones will usually bring additional cash for minor emergencies. What is the value of HE? A History Encounters journey creates memories for a lifetime, more than that though, it reinforces the lessons students learn about the founding of our country. Students learn about the men and women who sacrificed for freedom and are remembered as examples of character and responsible citizenship. Students learn about our democratic system of government and the role they must play for it to be successful. What about class time missed? Travel is one of the great learning experiences, especially when you travel with Freedoms Foundation. This is not a vacation but an educational experience. Participants will visit one-of-a-kind historical locations, learn about thinkers, inventors, artists, scientists, politicians, and who accomplished great things while also gaining insight into how people lived their day-to-day lives. Freedoms Foundation experts will help make sure your History Encounters journey complements and extends your classroom curriculum so students are learning while they have fun. What about students that don’t go? There are always students who, for various reasons, are unable to join their classmates in coming to Philadelphia. In those cases, schools have offered alternative enrichment programs at school or even alternative field trips locally. What about athletes who have games and/or practice? 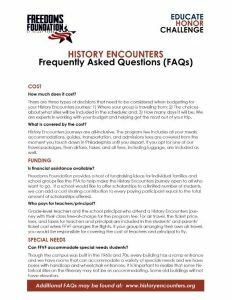 We encourage students and parents to consider a History Encounters journey as a real educational opportunity, a once-in-a-lifetime opportunity even, and thus way it next to other commitments like sports and/or work. If possible, it is always helpful when the school administration alerts coaches of impending class travel, giving them lots of time to make adjustments to schedules if at all possible. Payment can be made by check or by credit card. Parents will receive a registration form that includes payment instructions. Soon we plan to offer credit card payments online through our website. Payments consist of a deposit at registration and final payment 60 days before your journey.